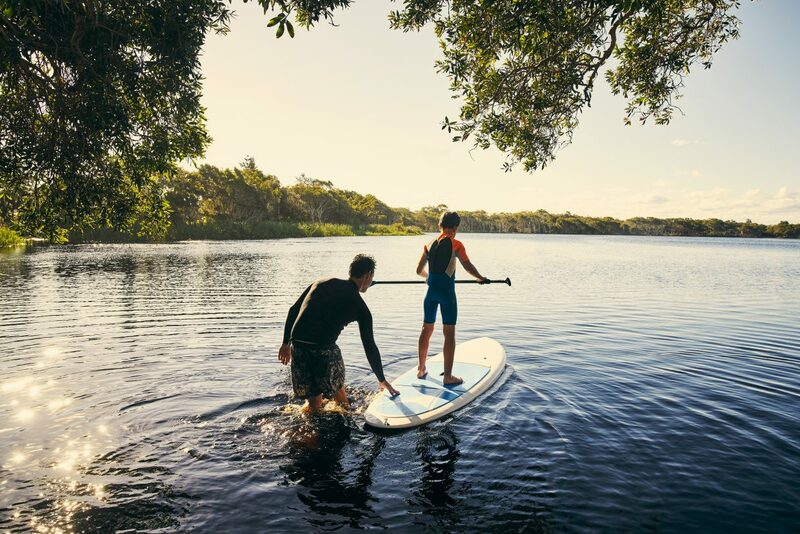 A father teaching his son to use a stand up paddle board. Stand Up Paddle Boarding is low impact, strengthens the core, tones every muscle and gets you on the water enjoying nature. To enjoy this sport, the following equipment is needed. • A board: In general, a wide board of 30 inches or greater should provide a good starting point for a beginner sup enthusiast. Carbon vacuum-bagged boards are light, durable, responsive and expensive. While soft-top boards are usually heavy, durable, easy to learn on and inexpensive. • A paddle: Like a canoe paddle, but longer, lighter and with a peculiar bend right near the blade, the SUP paddle is the second-most expensive item you will need. The general rule is that the paddle needs to be anywhere from 4 to 7 inches taller than you. • Personal flotation device: In some municipalities, standup paddleboards are classified as vessels. A PFD may be required whenever you’re paddling navigable water. • Extras: Depending on where and how you intend to SUP, you may need a leash for your board, a wetsuit and a trailer or other means of hauling your board. Learn more about the basics and how to SUP at standupjournal.com, or visit local merchants such as Good Vibes River Gear and Red Coyote Adventure for gear.